Welcome to the official mirror of RAWR-Designs. We no longer hold this domain and will not pay the excessive fee to get it back. This is an open source project for rejetto HTTP File Server. A Microsoft inspired template using jQuery to perform modern HFS functionality. 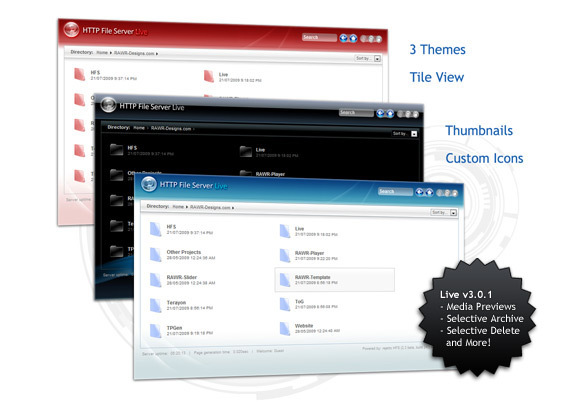 This is a reboot of the hugely popular HFS Live template created by Alvaro Quezada. 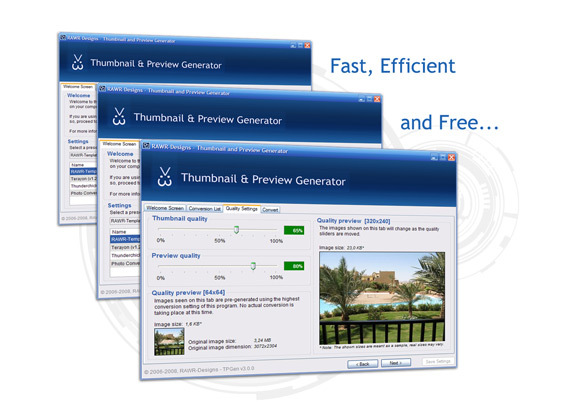 The Thumbnail and Preview Generator is an application written in Visual Basic .NET to ease the batch processing of images. It is a flexible program that can be used for much more than its intended purpose. RAWR-Template is a completely re-written hybrid between the ToG and Terayon. It is the first major distributed template for HFS to fully make use of the macro system. 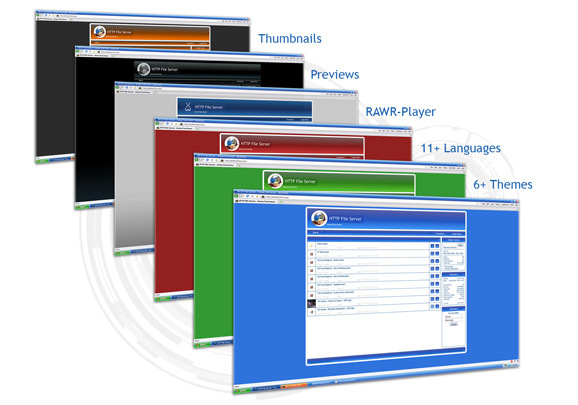 Terayon is based on the phpBB theme "Terayon V2b". It has been ported and modified to work on rejetto HFS. Terayon is a feature rich template that will make any HFS server look the part. The Thunderchicken of Glory is a lightweight, feature packed template. This was my second HFS template. The ToG has a long history with rejetto HFS and is still very popular today. 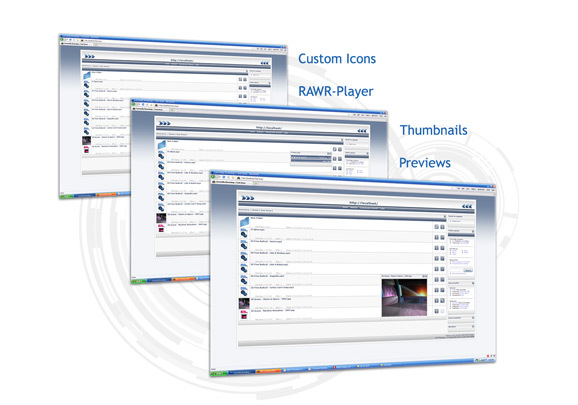 RAWR-Player is a dynamic flash player that interacts with the templates we create. It can also be used on its own. 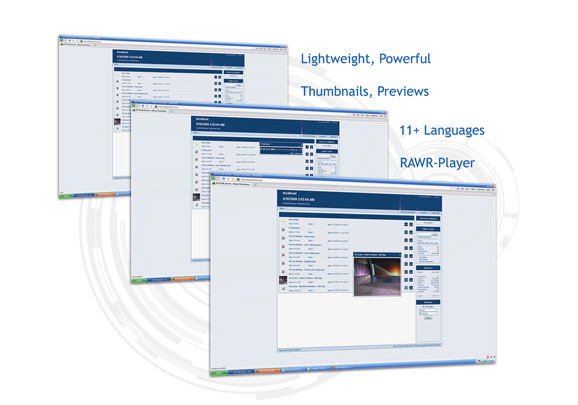 Features include: context menu items, dynamic theme and a simple interface. Supports .mp3, .flv, .m4a, .mov, .mp4, .3gp; almost any container that uses the H264 codec. A modified version of the "Black" template. This was my first HFS template, and one of my first HTML projects. I have kept it here for legacy purposes.